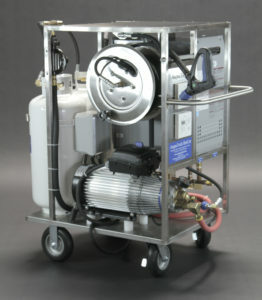 AaquaTools series of industrial flat-surface cleaners connect to a pressure washer and use a spray bar rotating at a high speed within 1″ of the ground. These surface cleaners will clean concrete more consistently than an operator with a wand, with less fatigue, 10-20 times faster and uses less water. These surface cleaners can be used with hot water up to 350º on most models for extra stubborn grease or grime, eliminating the need for soap pretreatment in most applications. Simply move the equipment over the surface and watch a clean path appear behind the unit.